• 110 Brazilian Business Leaders met in Punta Mita. Participants commented on the facilities, infrastructure of Riviera Nayarit and over all "a destination quite exciting"
A group of 110 Brazilian Business man gathered this last weekend in Rivera Nayarit for the 17th International Meeting of LIDE Economía. LIDE is the leading Entrepreneurs group in Brazil and its Annual Meeting is intended to strengthen thinking, relationship and ethical principles of corporate governance. The General Secretary for the state of Nayarit, who stood in representation for the Governor Roberto Sandoval, welcomed the guests and took part in the Panel: “Challenges of the Latin American Economy". The president of LIDE Economía, Mr. Paulo Rabello de Castro, thanked the Government and people of Nayarit for their hospitality and described Riviera Nayarit as an “exceptional and quite exciting destination for brazilians”. He became emotional when saying: “Nayarit’s Government has proven to us that. Besides the attractions and the world class infrastructure, they are absolutely capable of hosting an important event of this caliber and they’ve hosted it with the outmost professionalism”. 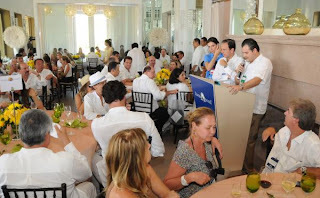 The Convention and Visitors Bureau (CVB) of Riviera Nayarit, a Non-Governmental, Non- Profit Association designated to promote Tourism to Nayarit, has assisted with this important reunion thus reaffirming its promise to create new alternatives and positions for the brand Riviera Nayarit in markets which have demonstrated their value for the Mexican Tourism industry. Designing strategies to attract visitors to the whole of the State of Nayarit and creating economical opportunities to benefit all of its inhabitants.